The dreaded double chin is a problem that many people battle. 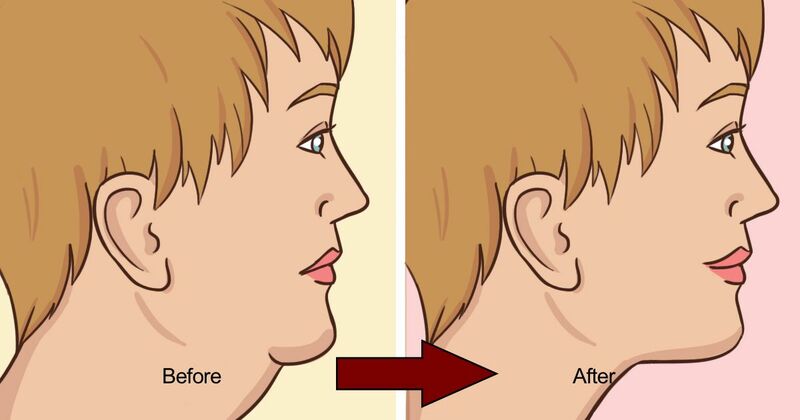 According to BeautyClue, weight gain and obesity are only two of the causes of the double chin. Age, genetics, bone structure, weight loss, posture and habitual facial expressions can also be culprits. Once that extra chin appears, you face the challenge of how to get rid of the excess roll of fatty tissue. Plastic surgery is an option, but Liposuction Costs reports that the cost for chin surgery can range from $2,500 to $5,000. If you want to avoid the high cost of surgery and potential side effects, you can try natural remedies at home for very little cost. Listed below are seven ways to naturally tighten the skin and combat double-chin problems. BeautyClue recommends increasing the amount of vitamin E you take in. Sources of vitamin E include green, leafy vegetables, liver and peanuts. You can also take supplements. Rapid Home Remedies also recommends rubbing vitamin E oil directly into your skin to increase the blood flow to the area and tighten it. According to Top 10 Home Remedies, rubbing melted cocoa butter into your skin twice a day will improve its elasticity and help decrease the double chin. Rapid Home Remedies recommends making an egg white face mask. The egg whites help tighten sagging and loose skin. Simply combine 2 egg whites, 1 tablespoon (15 ml) milk, 1 tablespoon (15 ml) honey, 1 tablespoon (15 ml) lemon juice and a few drops of peppermint oil to make the mask and apply it starting at the forehead, bringing it downward under your chin. Rapid Home Remedies and BeautyClue state that applying melon juice and apple juice to your face should tone the skin and help tighten a double chin. They recommend that you simply apply the juice with a cotton ball and leave on your skin for 15 to 20 minutes. Since being overweight can contribute to double chins, Rapid Home Remedies recommends drinking several cups of green tea during the day to speed up your metabolism and help you lose weight. BeautyClue states that wheat germ oil is supposed to soften the skin and improve its elasticity. The recommendation is to massage the oil into the chin every day for about 20 minutes. After 30 days, you just may see a difference. Massaging milk into the skin is also suggested by Rapid Home Remedies. The milk is supposed to tighten and tone the skin around the chin area. Massaging it in several times a day is recommended. No one likes a double chin, and most people don't have the money for plastic surgery. These simple remedies may provide the solution you want without the risks or expense. Maybe genetics can be fought after all.